[Fully rewritten version v3] To exist, risk and foresight products as well as warnings must be delivered to those who must act upon them, the customers, clients or users. These anticipation analyses must also be actionable, which means that they need to include the right information necessary to see action taken. Yet, if you deliver your anticipation when there is no time anymore to do anything, then your work will be wasted. Yet, even if you deliver your impeccable strategic foresight or risk analysis, or your crucial actionable warning to your clients in time to see a response implemented, but at a moment when your customers, decision-makers or policy-makers cannot hear you, then your anticipation effort will again be wasted. Let me give you an example. 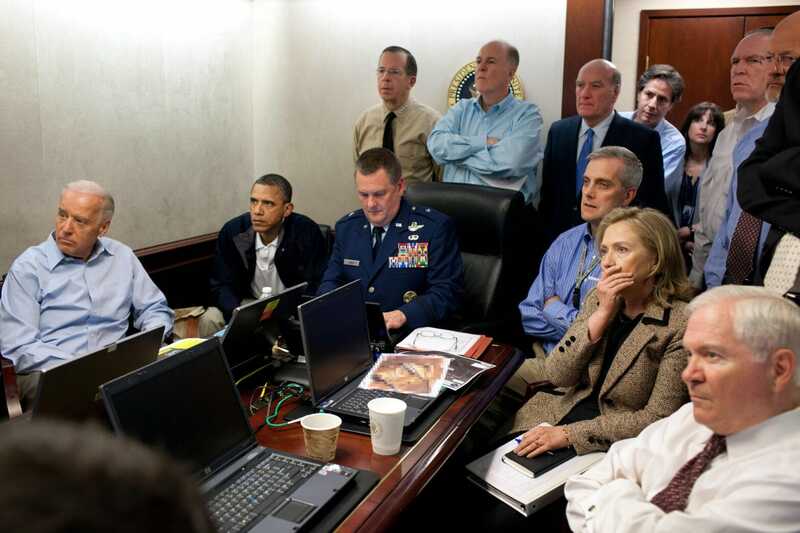 If you look at the picture used as featured image, what you see is the Obama government in a situation room as it awaits updates on the 2011 Operation Neptune’s Spear, the mission against Osama bin Laden. Imagine now that you have another warning to deliver (and the authorisation to do so) on any other issue, one with high impact but meant to happen in, say, 2 years time. Do you seriously believe that anyone in that room would – or rather could – listen to you? If ever you nonetheless delivered your warning, you would not be heard. Obviously, as a result, decisions would not be taken. Your customer would be upset, while the necessary response would not be implemented. Finally, endless problems, including crises, would emerge and propagate. Delivering an anticipation analysis or product must thus obey a critical rule: it must be done in a timely fashion. Timeliness is a fundamental criterion for good anticipation, risk management and strategic foresight and warning. In this article, we shall look, first, at timeliness as a criterion that enables the coordination of response. We shall explain it with the example of the controversial “Peak Oil”. Second, timeliness means that customers or users will not only have enough time to decide and then implement any necessary course of action as warranted by your strategic foresight and warning or risk analysis, but also be able to hear you. This is the problem of fostering credibility and overcoming other biases. We shall explain this part using again the examples of Peak Oil and taking as second example Climate Change. Finally, we shall point out a synthetic approach to understand timeliness and ways forward to achieve it. 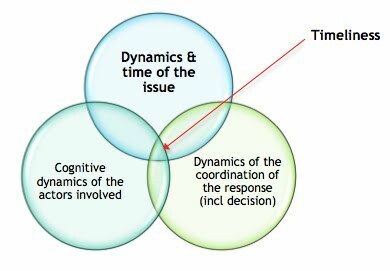 Most often, the challenge of timeliness is understood as stemming from the need to conciliate, on the one hand, the dynamics which are specific to the issue, object of anticipation, and, on the other, the related decisions and the coordination of the response. Thus, according to Hirsch, oil should peak before 2025. In 2018, the idea of Peak Oil may be thought as being outdated or plainly false, grounded in mistaken false science as exemplified by Michael Lynch, “What Ever Happened To Peak Oil?“, Forbes, 29 June 2018. Note that these arguments were already used prior to a phase of relatively wide recognition of the Peak Oil phenomenon around 2010, from scientists’ reports, associations, institutions and books (see, for example, the creation of the Association for the Study of Peak Oil & Gas in 2000 , Robert Hirsch report (2005), the Institut Français du Pétrole (IFP), Thomas Homer Dixon in 2006, Michael Klare or Jeff Rubin in 2010), to web resources such as the now defunct The Oil Drum and Energy Bulletin to finally the International Energy Agency (IEA – it recognised the peaking of Peak Oil in 2010, e.g. Staniford, 2010), despite still some resistance by then a shrinking number of actors. Since then, notably, the shale revolution took place, while climate change allowed an easier access to northern oil and gas fields (e.g Jean-Michel Valantin, “The Russian Arctic Oil: a New Economic and Strategic Paradigm?”, The Red Team Analysis Society, October 12, 2016). Peak oil is thus not very much on the agenda, although some still argue that it will happen, as, exemplified by the websites Peak Oil Barrel or Crude Oil Peak, which suggests that the oil will peak when the U.S. shale will peak (“What happened to crude oil production after the first peak in 2005?“, Sept 2018.) The peak in U.S. shales thus becomes a significant issue (e.g. Robert Rapier, “Peak Tight Oil By 2022? EIA Thinks It’s Possible, Without Even Accounting For This Risk“. Forbes, 20 February 2018; Tsvetana Paraskova, “Peak U.S. Shale Could Be 4 Years Away“, OilPrice, 25 Feb 2018). If the remaining proponents of peak oil are right and if some of the hypotheses of the EIA are correct, then Peak Oil could take place around 2022. This is not that far away from Hirsch estimates according to which Peak Oil could occur by 2025. We should nonetheless allow for the considerable evolutions that took place over the last 13 years, notably in terms of technology, including Artificial Intelligence, consuming behaviour, global consumption, and climate change. We should also allow for coming revolutions such as Quantum technologies which could completely upset many estimates. As long as all these developments with their complex feedbacks have not been considered, without forgetting that Hirsch addressed availability of cheap oil, not availability of expensive oil, then we must remain conservative and treat 2025 as only a possibility (a probability of 50%) for Peak Oil. Notwithstanding other impacts, Hirsch estimates that 20 years of a “mitigation crash program before peaking” would have allowed avoiding “a world liquid fuels shortfall” (Hirsch, 2005, 65). Thus, assuming that oil peaks in 2025, if we want to have an energy mix of replacement for the soon gone cheap oil, then we should have decided implementing and then coordinating a response… back in 2005. Note that, interestingly, this corresponds to the time when Hirsch published his report, and the time when the world started being worried about Peak Oil. We can thus wonder if, in specific countries, as well as collectively, SF&W on this issue was not actually delivered. To answer more precisely this question, further research, when archives are declassified, will need to be done. Meanwhile, it will be useful to follow precisely the delivery process, notably, according to countries and actors, to know where exactly the warning was delivered and to whom. If we now assume that Hirsch estimates of the time needed to develop mitigation and a new energy mix is correct, then we may consider that Hirsch, as well as the “peak oil” interest of the second part of the first decade of the 21st century, delivered a timely waning, as far as the time needed to implement answers is concerned. If and where the right decisions were taken and the right responses implemented would need to be evaluated on a case by case basis. Let us turn now to other criteria that condition the timeliness of the delivery of a risk or foresight analysis or of a warning. For Davis, credibility is the provision of “hard evidence” to back up strategic foresight, or actually any anticipation analysis. Of course, as we deal with the future, hard evidence will consist in understanding of processes and their dynamics (the model used, preferably an explicit model) added to facts indicating that events are more or less likely to unfold according to this understanding. This is why, building an excellent model (see our online course), grounded in science is so important, as this will be key in achieving the credibility criterion. Credibility is, however, also something more than hard evidence. To obtain credibility, people must believe you. Hence, the biases of the customers, clients or users must be overcome. Thus, whatever the validity of the hard evidence in the eyes of the analyst, it must also be seen as such by others. The various biases that can be an obstacle to this credibility have started being largely documented (e.g. Heuer). Actually, explaining the model used and providing indications, or describing plausible scenarios are ways to overcome some of the biases, notably out-dated cognitive models. Yet, relying only on this scientific logic is insufficient, as shown by Craig Anderson, Mark Lepper, and Lee Ross in their paper “Perseverance of Social Theories: The Role of Explanation in the Persistence of Discredited Information.” Thus, other ways to minimize biases must be imagined and included. The possibility to deliver the SF&W or risk product will be accordingly delayed. Credibility and, more broadly, overcoming biases are so important that I would go further than Davis and incorporate them within the very idea of timeliness. This would be much closer to the definition of timely, according to which something is “done or occurring at a favourable or useful time; opportune” (Google dictionary result for timely). Indeed, there cannot be timely SF&W or risk management if those who must act cannot hear the warning or analysis we seek to deliver. If the SF&W product or the risk analysis is delivered at the wrong time, then it will be neither heard nor considered, decisions will not be taken, nor actions implemented. More difficult, biases also affect the very capability of analysts to think the world and thus to even start analysing issues. We are there faced with cases of partial or full collective blindness, when timeliness cannot be achieved because SF&W or risk analysis cannot even start in the specific sectors of society where this analysis needs to be done. If we use again our example of Peak Oil, the 2005 warning could have lost part of its timeliness, because of debate regarding its credibility, which remains nowadays and is exemplified in the Forbes article above mentioned. On the other hand, the decision by the International Energy Agency (IEA) to finally recognise the peaking of Peak Oil in 2010 (e.g. Staniford, 2010) lent an official character to the phenomenon, that was very likely extremely important in finally allowing for the credibility of the warning. “For some scientists, there is not enough time left to take the actions that would keep the world within the desired limit. ‘If you really look seriously at the feasibility, it looks like it will be very hard to reach the 1.5C,’ said Prof Arthur Petersen, from University College London and a former IPCC member. This shows how the credibility issue is absolutely crucial for a warning to respect the timeliness criterion. The dynamics of cognition (or evolution of beliefs and awareness, including biases resulting from interests) – at collective and individual level – of the actors involved. To understand each dynamic is, in itself, a challenge. Even more difficult, each dynamic acts upon the others, making it impossible to truly hope to achieve timeliness if the impact of one dynamic on the others is ignored. For example, if we continue with the case of climate change, having been unable to truly even properly think collectively the possibility of climate change in its dire reality and with a more accurate timeline before the turn of the century – despite multiple efforts in this direction (e.g. Richard Wiles, “It’s 50 years since climate change was first seen. Now time is running out“, The Guardian, 15 March 2018), has dramatically changed the current possible dynamics of the response, while both the cognitive delay and the absence of previous decisions and actions have orientated the dynamics of the issue towards some paths, while others are definitely closed. Any SF&W or risk assessment delivered on this issue now, as shown by the October 2018 IPCC Panel discussions (Ibid. ), is quite different from what was delivered previously. To acknowledge the difficulty of finding the timely moment, and the impossibility to ever practice an ideal SF&W in an imagined world where everyone – at individual and collective level – would have perfect cognition, is not to negate SF&W or risk management. Answering the “timeliness challenge” with a “what is the point to do it now as we did not do it when things were easy/easier” is at best childish, at worst suicidal. Keeping permanently in mind this crucial issue in anticipation to seek and implement adequate strategies to overcome it, according to the ideas, moods, science and technologies available at the time of delivery. This is the 3rd edition of this article, considerably revised from the 1st edition, 14 Sept 2011. Anderson, Craig A., Mark R. Lepper, and Lee Ross, “Perseverance of Social Theories: The Role of Explanation in the Persistence of Discredited Information,” Journal of Personality and Social Psychology 1980, Vol. 39, No.6, 1037-1049. Campbell, Colin J. and Jean H. Laherrere, “The end of cheap oil,” Scientific American, March 1998. Davis, Jack, “Improving CIA Analytic Performance: Strategic Warning,” The Sherman Kent Center for Intelligence Analysis Occasional Papers: Volume 1, Number 1, accessed September 12, 2011. Dixon, Thomas Homer, The Upside of Down: Catastrophe, Creativity and the Renewal of civilization, (Knopf, 2006). Hirsch, Robert L., SAIC, Project Leader, Roger Bezdek, MISI, Robert Wendling, MISI Peaking of World Oil Production: Impacts, Mitigation & Risk Management, For the U.S. DOE, February 2005.
International Energy Agency (IEA), World Energy Outlook 2010. Klare, Michael, Blood and Oil: The Dangers and Consequences of America’s Growing Dependency on Imported Petroleum, (New York: Metropolitan Books, 2004; paperback, Owl Books, 2005). Klare, Michael, Rising Powers, Shrinking Planet: The New Geopolitics of Energy (Henry Holt & Company, Incorporated, 2008). Rubin, Jeff, Why Your World is About to Get a Whole Lot Smaller: Oil and the End of Globalization, Random House, 2009. Staniford, Stuart, “IEA acknowledges peak oil,” Published Nov 10 2010, Energy Bulletin.